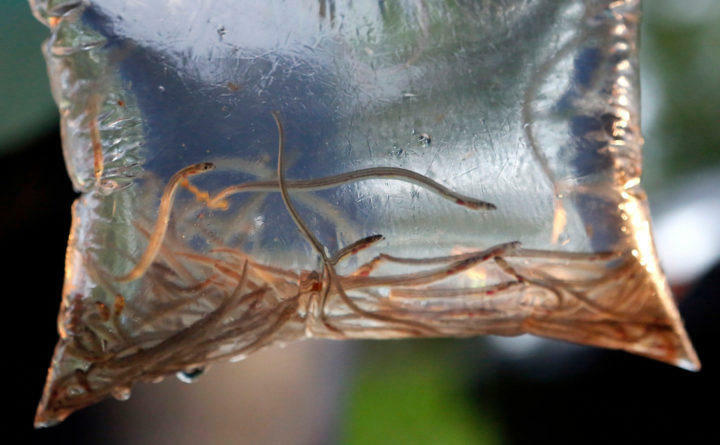 The sting involves the upwards of 20 people who authorities allege were illegally transporting more than $5 million worth of elvers from 2011 through 2014. The baby eels are sold to buyers in Asia, where they are raised and ultimately end up in Japanese dishes like Unagi. In 2014, the state introduced a swipe card system for elver fishermen which the Department of Marine Resources says has almost completely eliminated poaching. These days, the elver fishing world isn't quite as wild and crazy as it once was. But it's still a very special time of year for a few hundred very lucky Maine fishermen, who have a chance to make a lot of money in a very short time. They do it by spending some serious time, in the middle of the night, on a very cold river. In the light of an oil lantern, Chad Jordan and his brother Justin are standing quietly on the stone walls of the riverbank, waving their nets back and forth. “I'm making a steady current, and they get washed into the current, and then I pick them up in the next swoop,” Chad says. 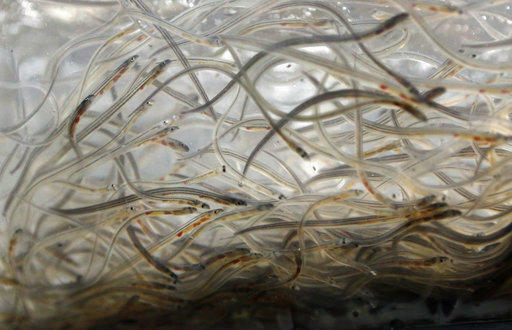 Elvers hatch in the Atlantic, and by springtime they are on their way to the rivers, lakes and ponds where they will spend most of their lives. Fishermen try to catch the young eels as they float by on the current. The swooping motion looks peaceful – almost hypnotic – but Justin says it's really hard work. Chad and Justin have been elvering for a couple of decades, and this year’s prices for the eels are some of the highest everat about $2,400 a pound. No one here talks about exactly how much they’re earning during the season, but the complicated state licensing and quota system means a few fishermen in the state would be allowed to catch enough elvers to earn $120,000 in only two and a half months. Justin and Chad probably aren’t those fishermen, but during elver season, they still have a chance to make a good portion of their year’s income, all at once. Chad says the burst of cash that comes from elvering is a blessing. “It really gets you out of the hole, and gets stuff paid,” he says. Elvers aren’t a traditional part of the New England diet, but adult eels are, going back to the Patuxet Indians. Justin says he remembers eating eel as a kid. “They squirm in the pan the whole time you cook them,” he says. And as for the Japanese version? “I've never had unagi, but i eat the first elver I catch every year, just for good luck for the season. It's a little salty, like the water, but it doesn't taste like much because it's so small. Elver season continues until June 7. This story was originally published April 20, 2018 at 6:07 p.m. ET. The interstate baby eel poaching sting known as Operation Broken Glass has notched three more criminal sentences. 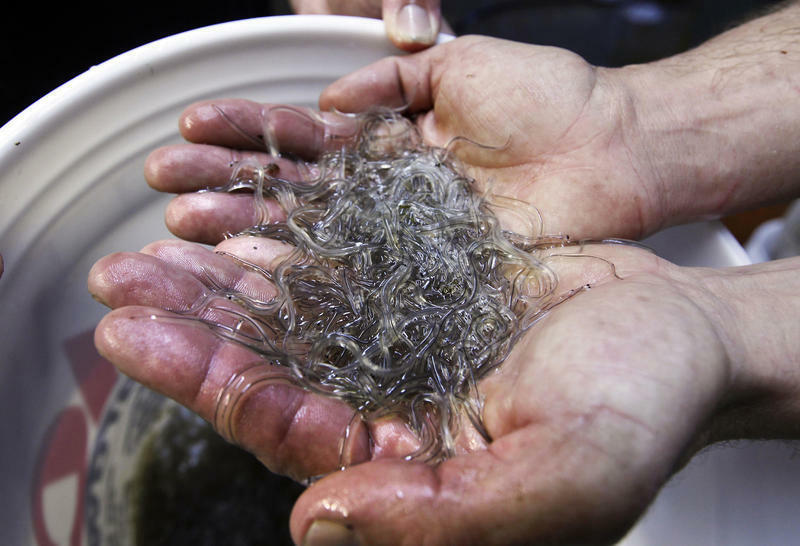 On Thursday, a federal judge in Portland sentenced three men who were together accused of poaching and selling as much as $1 million worth of baby eels, known as elvers, to a mix of probation, restitution and fines.